Proactive online reputation management (ORM) is increasingly becoming more important than ever to a company’s success. The brand-name search engine result page (SERP) is the first thing any potential customer will learn about your company, and has become the public face of a business. As we all know, first impressions are everything. In fact, studies have shown that over 90% of Internet users never go past the first page of search results, so it’s critical that this first page present an informative, useful and ultimately positive view of your company’s brand. In today’s Internet landscape, most businesses are subjected to a negative online attack of some form. This attack usually comes with a high-risk chance that an offending entry will reach the top of search result pages and remain in this prominent position for all to see. This risk is common because negative material is considered ‘interesting’ by many internet users. With such situations being likely, ask yourself this question – is it worth investing large amounts of time and money into SEO and PPC campaigns, when ultimately a search of your brand name could detract from a consumer enquiry or even an initial conversion due to the presence of an offending piece of media? In this article we detail how you can apply proactive online reputation management strategies to combat potentially negative entries surfacing. It is important to give your website the best fighting chance of obtaining sitelinks. To do this, ensure your website is well organized and user-friendly with a clear page hierarchy and a consistent internal linking structure using relevant & descriptive anchor-text. By user friendly, of course we also mean robot-friendly, since search bots will be crawling your site and deciding how relevant each page is. Ensure your website has no crawl errors within Google Webmaster Tools and that you regularly submit an up-to-date XML sitemap. Sitelink search box – As well as sitelinks, Google may also deem your website applicable to have a search box within the SERP that allows all indexed pages on your website to be searched. To encourage this box to be displayed, there are a several techniques that you can apply to your website that have been detailed by Google, namely, adding a search engine to your website (e.g. Google Custom Search) and adding search box Schema markup to your site. Google My Business/Knowledge Graph – If you have not already signed-up for, verified and optimized your business for Google My Business (GMB) then you’re missing a trick. Doing this can increase your chances of an informative ‘knowledge graph’ box appearing on the right at the top of brand name search results, which can prominently display key information such as contact details, business opening times, social media profiles, reviews and pictures. Furthermore, if you have multiple locations there is also potential for a Google Snack Pack to be displayed, which can promote you to a degree that’s equivalent to 5 organic listings! 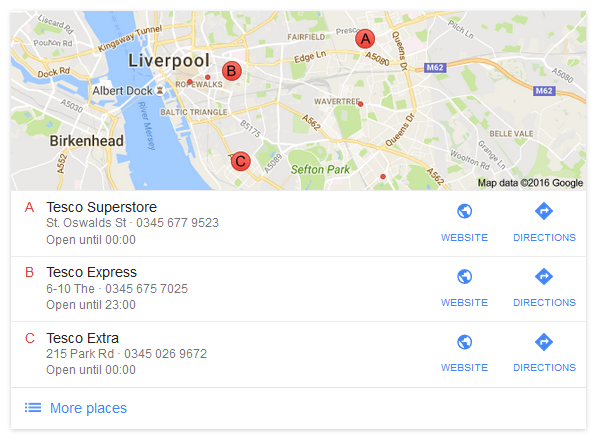 To optimize your GMB profile to increase your chances of a Knowledge Graph and/or a Snack Pack listing, you should ensure that all business locations are claimed and accurate information is comprehensively completed for each location – including contact and address details, opening hours, etc. These details should also match those listed elsewhere online, such as on your official website/blog (use Schema to mark this up) and corporate directories (e.g. Yell, Yelp, 192.com) for consistency. Also, be sure to add images of your business and be sure to verify your social media accounts with Schema markup on your official website to increase the chances of them being listed in the Knowledge Graph. 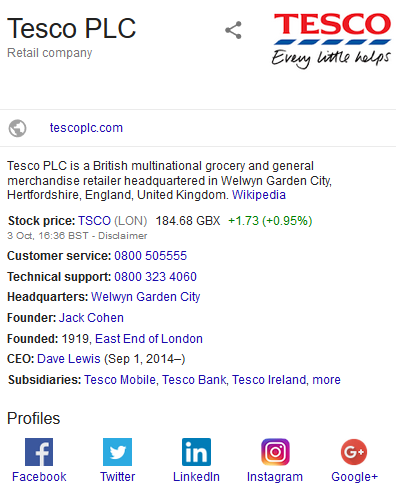 Google News – Companies that have regular news regarding their brand may be selected to have a Google News widget displayed within the SERP. In order to have news issued directly from your brand rank in this widget area, you should issue regular company news to Google News listed sources – commonly both regional and national news websites. The content should be original, relevant, well-written and be news applicable in terms of context. Secondary website – In any set of brand search results, the official website of your company should generally rank at position #1. But there is also an opportunity to control another position in the results. For this reason, many businesses setup secondary websites for a company blog, news center or even a recruitment website. These sites can be setup on a sub-domain, a 3rd party blog service such as BlogSpot/WordPress/Tumblr, or even on an alternative domain. It’s important to remember, a little goes a long way, even if you don’t immediately dominate the entire first page, gaining control of the first four or five results above the fold will make a huge difference in influencing how customers will perceive your brand. Google Autocomplete – The most immediate set of search results you will be presented with before you have hit the ‘enter’ key will be Google’s suggested search results. These results are created based upon monthly search volume, mentions around the web and several other key factors. In most cases and by default, only up to 4 results will be displayed in Autocomplete, this can however be increased to 10 results by manually going to Google search settings and selecting the option ‘Never show instant results’ under the Google Instant predictions section. 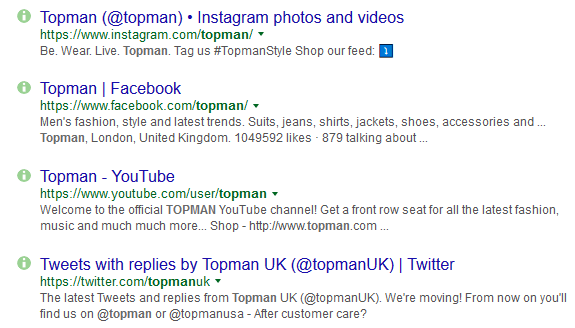 Let’s assume that the majority of potential customers will only see 4 suggested search results – have you investigated what the organic search results look like behind each of these keywords? As well as dominating page 1 for your exact-match brand name keyword, it’s also a worthwhile strategy to aim to control the top positions in the SERPS for each of these suggested search terms as they are likely to be receiving substantial amounts of traffic. As the most popular search engine, Google is the best place to start, but don’t ignore other search engines. For a really solid reputation you’ll need a good SERP across all bases a customer could potentially use to search for your business. This post is brought to you by ReputationDefender – one of the world’s leading ORM companies, helping brands establish an in-depth internet presence that is resilient to negative publicity. Follow ReputationDefender on Twitter for the latest news, updates and strategies in reputation management and online privacy.